We are a week into Nebraska's fall camp. Has anything changed from our first roundtable? 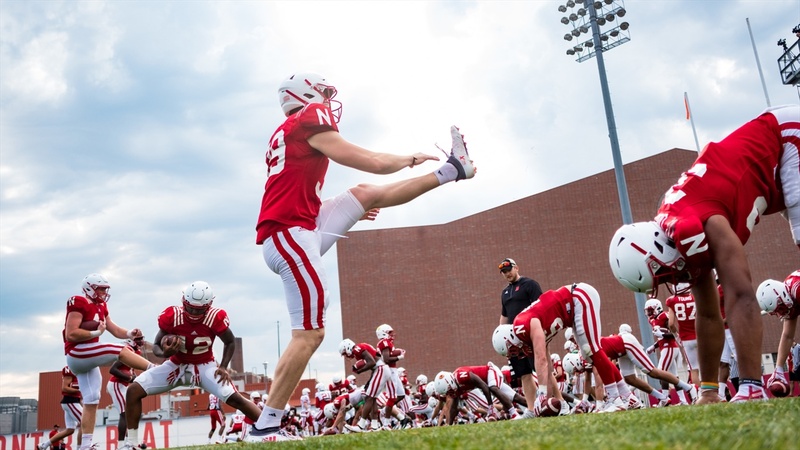 With the Huskers off on Monday, Brandon Vogel, Erin Sorensen, Greg Smith, Jacob Padilla and Derek Peterson look back on the first week of fall football. We did a roundtable before fall camp kicked off and asked about a major question you want answered during camp. Through the first week, did you get closer to an answer to your question or has it changed altogether? BV: I don’t think I’m any closer to knowing how the secondary shakes out, but I still have it at the top of my list. I continue to look at this season, from the advantageous position of August, as a question of “what raises the Huskers’ ceiling the most?” because I’m totally confident they’ll improve, it’s just a matter of scale. And, outside of excellent quarterback play from a still-unknown source, I think a major secondary upgrade is Nebraska’s best chance to raise its ceiling the most. ES: I don’t think I’m really any closer after one week to understanding the offensive line’s depth. Derek brings some of the depth talk up below, but it all still sounds very uncertain at this point. I think I’m stuck until the actual depth chart comes out to know what Nebraska is really up against. GS: No, I’m not really any closer to finding out who will start and see the most time at OLB. I’ll stick with my prediction of Luke Gifford and Tyrin Ferguson as the starters though. JP: I touched on the topics everyone else chose here in my response but settled on the inside linebacker battle, but I don’t think we’re any closer to seeing the total picture at that spot. I think most expected Will Honas to step right into the spot vacated by Chris Weber, but at this point it seems like Mohamed Barry might have the inside track next to Dedrick Young II. Even if that’s the case, it still seems like all three will play a lot. Jovan Dewitt did give at least a little insight into the outside linebacker/pass rush situation and Cam Taylor is making the cornerback picture even more interesting, but since we don’t get to see practice it’s hard to judge progress by the offensive line and safety seems to be about where we thought it was heading into camp. DP: My question rested in the offensive backfield. How would the running back rotation shake out? Asked specifically about that this week, Troy Walters was a little non-committal, just saying they used four at Central Florida and that could be the case here. We don’t really have an idea of what the play distribution will look like yet and that brings with it it’s own set of questions. But I think we did get a much clearer picture of the totem pole. It appears that the top four guys are Greg Bell, Maurice Washington, Tre Bryant and Devine Ozigbo. Ozgibo came up on several occasions; Mikale Wilbon was listed at the end when Scott Frost ran through the position and Jaylin Bradley hasn’t been named at all (which could be an answer for our next question if I’m being honest). What was the most surprising thing you either heard or saw during week one? BV: That stretching is hard. By design. I mean, it makes total sense given Frost’s Oregon roots and appreciation for sports science, so I guess this wasn’t so much a surprise as it was just entertaining. “It’s kind of a rite of passage,” Frost said, “to not only be able to go through stretch but really dominate stretch. It’s a mentality thing for us as well.” We learn in the August issue of the magazine who the best video game player on the team is, now I want to know who the best stretcher is. ES: Similar to what Brandon said, the stretching thing gave me pause. I understood it, though. Stretching was always my least favorite part of playing sports because I’m just not naturally flexible. I despised stretching. Aside from that, though, I was honestly surprised by the hype. I knew it would be there and I expected it. I can also tell Frost is trying desperately to keep that hype in check. It’s going to be hard, because I’ve seen season predictions move from six wins to eight wins to maybe nine or more in the matter of one week. Just imagine where we’ll be by September. GS: I’m still surprised that Maurice Washington made it to Lincoln and is a full participant. Based on all of the talk surrounding him, it feels like he has been on campus for months. Since it has been 10 days since he got here, it technically doesn’t count for “during week one” but I’m going with it anyway. JP: I’ll go with the degree to which Cam Taylor has drawn praise from his teammates and coaches. I wasn’t expecting much from either freshman cornerback heading into fall camp because both Taylor and Braxton Clark seemed more like projects than plug-and-play options (I mean, Taylor was playing quarterback last year). However, Taylor has apparently blown everyone away and is a legitimate option to steal snaps from the returners, which would not be a bad thing at all. As Lamar Jackson has said, there’s a lot more competition in that room now and the vets are either going to rise to the occasion or they’re going to get passed up. DP: I think I was most surprised by the positivity surrounding the secondary. Safety was a position I felt, well, safe about for the most part given the influx of new talent. Even with all the new bodies at corner, though, part of me was a little curious about whether the Lamar Jackson praise during the spring was motivational, lip service, or full-blown honesty. That Scott Frost came up to Jackson and said, "Whatever you're doing, keep doing it," is surprising. That Erik Chinander wasn't comfortable with the secondary in the spring and is now, after a week, saying they are the most improved unit on the team is surprising. That they have supposedly turned into an uber-disruptive bunch now is surprising. Not in the sense that it happened at all — Nebraska needed it to — but more how quickly it all came together. There really was minimal talk surrounding the offensive line throughout the first week while the running back room grew into the talk of the town. If running back coach Ryan Held’s group is as-advertised once the season begins, does that change how you view the offensive line? Small sample size, yes, but if Nebraska would’ve had the opportunity rate it had on Bryant’s carries for all carries the Huskers would’ve ranked second nationally in that stat. Better backs certainly can help this line look better, but not so much to this point that I’m ready to assume the Huskers will have no worries on that front in 2018. ES: Look, Nebraska has some talented running backs on this roster. Can any of them be Ameer Abdullah in his game-winner against McNeese State? (MCNEESE STATE!) Maybe, but it would be nice to be able to rely on the offensive line to help create opportunities versus the running backs just figuring out ways to get open. The latter will happen from time-to-time, but it can’t be the basis of your offense. The offensive line has to dominate, so no. I’m still keeping an eye on that offensive line until they give me a reason to look elsewhere. GS: It doesn’t really change my view of the offensive line. I think that most observing or cheering for Nebraska is in full wait and see mode with the offensive line. In theory, they should be much improved given the experience of the unit, improved schemes and coaching. They will need to perform before views are changed. JP: I wrote a lot about the offensive line in my position preview, so just go read that. Short answer: no matter how dynamic those backs might be, Nebraska needs the line to do its job or the Huskers are not going to get anywhere near their ceiling. DP: Frost talked about line depth a bit last Friday and said the team was still waiting for some younger guys on the ends to earn the staff’s trust behind Brenden Jaimes and Matt Farniok so that could become a bit concerning if the situation lingers too much longer. Still, I’ll go against the grain and side on the more optimistic end of things. A good back makes a world of difference. That offensive line that blocked for a 192-yard back in the opener was the same line that blocked for everyone else throughout the season wasn’t it? Obviously, there were injuries that changed personnel but the scheme was the same, the core group was the same, and most people would probably argue Jaimes was more productive at tackle than the guy he replaced. We’ve already been told the new scheme is advantageous for linemen (and on paper it makes sense) so if there are dynamic runners — plural being key — that can mix and match in the backfield and we figure the play-calling will be up to snuff, I’d say the line would have a larger margin for error than I expected. I’m hedging my bets a little, those are a lot of assumptions to make. Does the group need to improve over last season? Absolutely, but a little help goes a long way.